Based on the ACOSS Poverty in Australia Report in 2014, poverty in Australia is growing. An estimated 13.9% or 2.5 million people are living below the internationally accepted poverty line. This is alarming and should be a wake-up call not just for the community and the government, but for businesses as well. Caritas Australia, one of Alsco’s customers using tea towel cleaning services since April 2008, is a one of the agencies that help the poor and works to support poverty relief. They are a group of people who reach out to countries who needed help. Alsco is honoured and happy to be servicing, not just businesses in Australia, but also organisations with a good cause. Companies and businesses in Australia can participate and take the initiative on making an impact on improving the lives of the less fortunate. Check out Caritas Australia’s inspiring story and the actions businesses can take as part of their Corporate Social Responsibility in their own words. Caritas Australia is the international humanitarian relief and development agency of the Catholic Church in Australia. Through effective relationships with the Church, local partners and communities in the Middle East, Africa, Asia, Latin America, the Pacific and with First Australians, Caritas Australia helps to end poverty, promote justice and uphold dignity. Our programs, advocacy and education initiatives promote the dignity of every person, regardless of religious, political or cultural beliefs. We envisage a world in which children, women and men most vulnerable to extreme poverty and injustice are architects of their own sustainable development. 1. How did Caritas Australia come to life? Caritas Australia was born from a worldwide Catholic movement to support poverty relief. From 1954, Caritas Internationalis operated as a global confederation of Catholic relief, development, and social service organisations. Ten years later, Australia became a member of this confederation. The United Nations’ Freedom from Hunger campaign in 1960 spread awareness of global poverty and malnutrition, and in 1962 the Australian Episcopal Conference, the permanent assembly of the Bishops of Australia joined the campaign. A mechanism was created for handling funding requests from the Church, and from this the Catholic Overseas Relief Committee evolved, a permanent body to administer the Church’s work in overseas relief. Around the same time, parishioners in the dioceses of Adelaide, Sydney and Wagga Wagga were running appeals during Lent to fund missionary work and poverty relief projects overseas. The Australian Bishops agreed to support a national Lenten fund raising appeal for relief projects in the Asia-Pacific region. In November 1964, the Catholic Overseas Relief Committee was charged with overseeing the Lenten appeal in addition to its task of handling requests for funding. This was the start of Caritas Australia (the name was changed in 1998). Caritas is the Latin word for love and compassion. 2. What is Caritas Kitchen and how can supporters take part in this initiative? 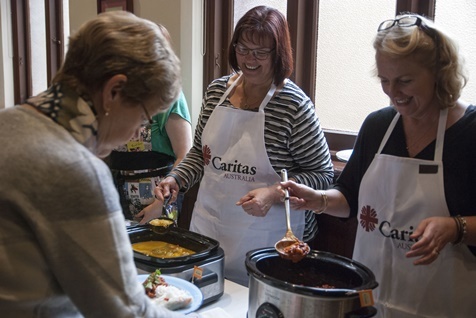 Caritas Kitchen is an opportunity to raise funds and awareness for some of the world’s poorest people, those supported by Caritas Australia and serve your friends and family a wholesome, homemade meal at the same time. It is a new community fundraising initiative developed by Caritas Australia which allows our supporters to host their own ‘Caritas Kitchen’. As a host you decide what your event will look like, whether it’s a home cooked lunch in the office amongst colleagues, at school or something you’d rather do at home with friends, we’ve made it easy to host a fun and interesting event. With the help of invitations, conversation-starting placemats, food flags and more that come in the beautifully designed host pack we’ll help you create a great event. Simply register to be a host online at www.caritas.org.au/caritaskitchen, invite guests using our online invites, collect donations for the cause through our safe and secure online platform, then use the international recipe cards to create a meal to wow your guests. Each recipe will relate to one of the programs that Caritas supports so that host and guests alike can learn about the people whose lives have changed – thanks to the support of everyday Australians. Across the globe we all spend a lot of time in the kitchen, whether it is cooking the daily meal, contributing to a celebratory feast or just doing the washing up, it doesn’t matter where we are, the kitchen always brings us together. Caritas Kitchen hosts and guests will learn about the differing realities of ‘kitchens’ and the difficulties of putting food on the table in our partner communities around the world, all while having fun with friends. 3. What is the best experience you have while working for Caritas Australia? I had the opportunity to travel to Kenya and Tanzania in 2014, during which time I was able to visit various programs that Caritas supports. In each of the programs it was evident how growing, preparing, or sharing food is central to everyone’s lives, just like it is here in Australia. This, along with requests from our supporters, was the catalyst for what became Caritas Kitchen. While the programs and their objectives vary widely, from child rights and livelihoods to training in agricultural techniques, a common theme in each program is the gathering of people to share food. When I visited the Pendekezo Letu program in Nairobi, Kenya that finds lasting solutions to the enduring problems of child exploitation and mistreatment, I witnessed the kids in the boarding school coming together to make bread to share with the rest of the school. I visited the families of these children who are given small business loans and learnt all about one grandmother’s new store in which she sells hot tea and fresh beans to her community, enabling her to now keep her grandchildren in school. In a completely different program in Malindi on the Kenyan coast, I visited rural communities that have been transformed after being involved in agricultural programs. Farmers had been introduced to livestock production through the provision of quality animals for cross-breeding and beekeeping and had begun planting drought-resistant crops such as cassava. This reduces risk and widens the economic base of the farmers by providing alternative safety nets while also providing enough food for their families to eat and to share. 4. What can businesses do to help Caritas Australia achieve its goals? There are many ways a company can partner with Caritas Australia that can impact positively on a company’s business, from how they express their values, to how they motivate their staff and strengthen their brand. Companies can give unrestricted gifts which enable us to continue our development work around the world, directing funds to where they are needed most at the time. Supporting a specific Caritas project over a number of years allows Caritas to plan for the future and brings the company and its staff closer to our work, enabling them to really see the impact of their support. By sponsoring a fundraising initiative or event, companies save Caritas Australia expenses so funds raised can be spent where they are needed most, on our projects. It is also a great way to increase an organisation’s brand exposure and develop new contacts and customers. Workplace giving is one of the most efficient and cost-effective ways of making a donation to Caritas Australia. Ongoing donations are deducted automatically from employees’ pre-tax salary each pay period, allowing Caritas Australia to plan long-term projects to assist communities experiencing poverty and injustice. And by setting up a matched giving program, companies can increase their employees’ impact. Companies can get their whole team involved in supporting Caritas by signing up to Caritas Kitchen and hosting meals at work or in their own homes or Caritas Ks and covering kilometres for compassion. Both these initiatives are great ways to raise awareness and funds, and doing it in a corporate team increases the exposure for Caritas. Contact Caroline Christensen to discuss engagement opportunities between Caritas Australia and your organisation. 5. If Alsco is to offer Caritas Australia a 1-year full service of one of our products, what would it be? And why do you like it best? A 1-year full service of tea towel cleaning. This service provides hygienic practices within the office. With the staff using the kitchen, it is important that our kitchen and utensils provide a bacteria free environment. Alsco would like to thank Penelope Frew, Events and Fundraising Coordinator of Caritas Australia. Helping people overcome poverty, regardless what race they are, religion and beliefs, is Caritas Australia’s goal. The food industry sector can actually help in supporting poverty relief by reducing food waste. Get involved and be a part of the solution. At Alsco, we want to make sure that your work area is clean and safe from bacteria. Experience the amazing benefits you get using Alsco’s Tea Towels – we offer a one-week FREE trial. For more information, contact us now 1300 659 892!